Researchers from NOAA GLERL and the Cooperative Institute for Great Lakes Research (CIGLR), know formerly as CILER, along with other collaborators, will showcase their work on observations, advanced technologies, harmful algal blooms, modeling, forecasting, and more at the 60th Conference on Great Lakes Research on May 15-19th in Detroit, Michigan. Here’s a schedule of where you’ll find our scientists and their research throughout the week (presentation titles linked to online abstract and poster titles linked to .pdf of poster, if available.) And, don’t forget to swing by the NOAA and CIGLR exhibitor tables for more information on our research programs, collaborations, or to grab a copy of one of our recent publications. For more information you can find .pdf of the full abstract book on the IAGLR conference website. 4:20P RUTHERFORD, E.S., GEFFEN, A.J., NASH, R.D.M., WELLS, D.J., GLYSHAW, P., VANDERPLOEG, H.A., CAVALETTO, J.F. and MASON, D.M. Have Invasive Species Caused Changes in Larval Fish Density and Distribution in SE Lake Michigan? Using the Fluoromarker Calcein to Assess Growth Rates of Quagga Mussels in situ. MABREY, K. (1), GLYSHAW, P. (1) and ELGIN, A.K. 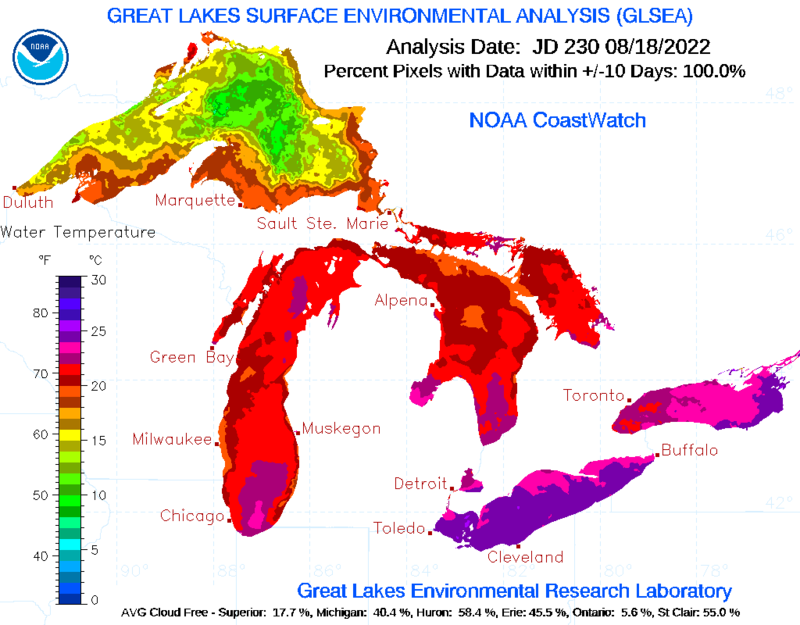 (2) – (1) CILER University of Michigan, G110 Dana 440 Church St, Ann Arbor, MI, 48109, USA; (2) NOAA Great Lakes Environmental Research Laboratory, 1431 Beach St., Muskegon, MI, 49441, USA. Mysis diluviana is a key member of Great Lakes aquatic food webs and is important prey for pelagic planktivores. Mysis are visual predators of zooplankton, and migrate diurnally from the lake bottom into the water column. Mysis biomass estimates are highly variable but critical for food web models that inform salmonid stocking decisions. In 2016, we evaluated catch efficiency of Mysis in a Multiple Opening/Closing Net and Environmental Sensing System (MOCNESS) with LED strobe lighting that is used to sample plankton and fish larvae in marine waters. We sampled Mysis density at a mid-depth (45 m) station in June and July, and at an offshore (110m) station in September off Muskegon, MI. We made replicate tows in thermally stratified depth layers during day and night, and compared Mysis densities sampled with the LED strobe on vs strobe off. There were no significant differences in Mysis density among depths in samples with strobe on or off in any month. Mysis were concentrated in dense layers in the metalimnion at night, and were highest in the hypolimnion during day. We conclude that the strobe flash light had no effect on catch avoidance by Mysis. Forecasting Lake Levels Under Climate Change: Implications of Bias Correction. CHANNELL, K.E. (1), GRONEWOLD, A.D.(2), XIAO, C.(3), ROOD, R.B. (1), LOFGREN, B.M. (2) and HUNTER, T.(2) – (1) University of Michigan Climate and Space Sciences and Engineering, Ann Arbor, MI, USA; (2) NOAA Great Lakes Environmental Research Laboratory, Ann Arbor, MI, USA; (3) Cooperative Institute for Limnology and Ecosystems Research, Ann Arbor, MI, USA. Numerical models can provide a basis for projecting future water levels for the Great Lakes under climate change. Hydrological components critical to generating water supplies were extracted from the WRF/GFDL-CM3 downscaled climate model, and were then used to drive a routing model to produce water levels for the 21st century. A new method of bias correction was used to provide a more consistent representation of seasonality, trends, and variability, when compared to more conventional methods. Here we demonstrate the relative differences in hydrology projections from our method and previously used methods. Our results indicate that the bias correction method used is an important source of variability in water level projections. This is a source of variability that is perhaps just as important as choice of models, emission scenarios, etc., but is commonly overlooked. (1) Climate and Space Science and Engineering, University of Michigan, 2455 Hayward St, Ann Arbor, MI, 48109, USA; (2) NOAA Great Lakes Environmental Research Laboratory, 4840 S State Rd, Ann Arbor, MI, 48108, USA. Over the past several decades, dramatic changes in the spatial extent of seasonal and long-term ice cover have been documented for both marine and continential water bodies. Successfully projecting future changes in global ice cover requires an understanding of the drivers behing these historical changes. Here, we explore relationships between continental climate patterns and regional ice cover across the vast surface waters of the Great Lakes. Our findings indicate that abrupt historical changes in Great Lakes seasonal ice cover are coincident with historical changes in teleconnections, including both the El Nino Southern Oscillation (ENSO) and Pacific Decadal Oscillation (PDO). We find, in particular, that these teleconnections explain much of the ice cover decline in the late 1990s (coincident with the strong 1997-1998 winter El Nino) and the following persistent period of below-average period of ice that followed. We encode these relationships in a probabilistic model that provides seasonal projections of ice cover areal extent across the Great Lakes, as well as specific spatiotemporal patterns in ice cover at resolutions that align with critical regional human health and safety-related management decisions. XIAO, C.(1), LOFGREN, B.M. (2), GRONEWOLD, A.D.(2), GOCHIS, D.(3), MASON, L.(1) and PEI, L.(3) – (1) Cooperative Institute for Limnology and Ecosystems Research (CILER), University of Michigan, 4840 S. State Rd., Ann Arbor, MI, 48108, USA; (2) NOAA Great Lakes Environmental Research Laboratory, 4840 S. State Rd., Ann Arbor, MI, 48108, USA; (3) National Center for Atmospheric Research (NCAR), P.O. Box 3000, Boulder, CO, 80307, USA. As a physics-based, spatially-distributed hydrologic modeling system, the community Weather Research and Forecasting model (WRF) hydrological extension package (WRF-Hydro) has been used in several streamflow prediction applications in the U.S. and around the world, including the National Water Model (NWM) at the newly established NOAA National Water Center. 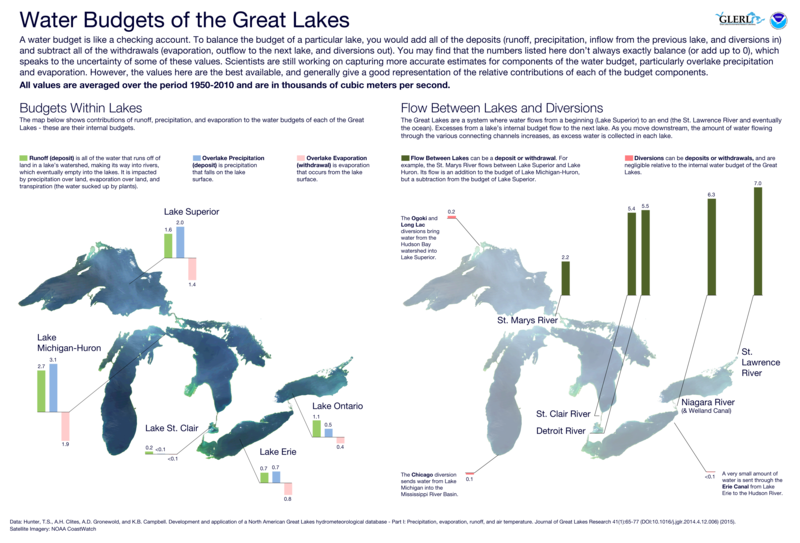 However, because of lack of consistency of the geofabric data along the U.S. and Canada borders, the Great Lakes basin is not entirely included in NWM, leaving a substantial gap for applying the national model to the water-dominated region. Thus, a specific effort has been devoted to implementing the WRF-Hydro modeling system in the Great Lakes basin, including preparing high-resolution terrain datasets, parameterizing lakes and reservoirs, and calibrating the model. Two experiments have been carried out to support implementation of the NWM in the Great Lakes basin: an offline WRF-Hydro simulation forced by NLDAS2 and a coupled WRF/WRF-Hydro simulation. The model results are validated against observations in terms of precipitation, runoff, soil moisture, channel flow, and land surface heat fluxes. Our preliminary study presented here shows that the WRF-Hydro model is capable of reproducing the land-hydro-air feedbacks in the Great Lakes region. Investigation into Recent Meteotsunami Events in the Great Lakes. ANDERSON, E.J. (1), BECHLE, A.J. (2), WU, C.H. (2), CHU, P.(1), MANN, G.E. (3), SCHWAB, D.J. (4) and LOMBARDY, K.(5) – (1) NOAA GLERL, 4840 S. State Rd, Ann Arbor, MI, 48104, USA; (2)University of Wisconsin-Madison, Madison, WI, USA; (3) NWS WFO-Detroit, Detroit, MI, USA; (4) University of Michigan, Water Center, Ann Arbor, MI, USA; (5) NWS WFO-Cleveland, Cleveland, OH, USA. Meteotsunami events have been documented in several countries around the world in the coastal ocean, semi-enclosed basins, and in the Great Lakes. In particular, investigations in the Great Lakes have raised the issue of dangers posed by enclosed basins due to the reflection and interaction of meteotsunami waves, in which the destructive waves can arrive several hours after the atmospheric disturbance has passed. This disassociation in time and space between the atmospheric disturbance and resultant meteotsunami wave can pose a significant threat to the public. In recent events in the Great Lakes, atmospheric conditions have induced meteotsunami waves in Lake Erie and Lake Superior. The resulting waves impacted swimmers, inundated a marina, flooded coastal communities. In this work, we attempt to explain the processes that led to these conditions through a combination of atmospheric and hydrodynamic modeling and an analysis of the observed meteorology. Results from a high-resolution atmospheric model and hydrodynamic model reveal the formation of destructive waves resulted from a combination of wave reflection, focusing, and edge waves, though important differences have been found between recent events in the Great Lakes. FITZPATRICK, L.E. (1), FUJISAKI-MANOME, A. (1), GRONEWOLD, A.D.(2), ANDERSON, E.J. (2), SPENCE, C.(5), CHEN, J. (4), SHAO, C.(4), POSSELT, D.(3), WRIGHT, D.(3), LOFGREN, B.M. (2) and SCHWAB, D.J. (3),- (1)Cooperative Institute for Limnology and Environmental Research, Ann Arbor, MI, USA; (2)Great Lakes Environmental Research Laboratory, Ann Arbor, MI, USA; (3)University of Michigan, Ann Arbor, MI, USA; (4)Michigan State University, East Lansing, MI, USA; (5)Environment Climate Change Canada, Gatineau, QC, CANADA. The extreme North American winter storm of November 2014 triggered a record lake effect snowfall (LES) event in southwest New York. This study examined the evaporation from Lake Erie during the record LES event between November 17th-20th, 2014, by reconstructing heat fluxes and evaporation rates over Lake Erie using the unstructured grid, Finite-Volume Community Ocean Model (FVCOM). Nine different model runs were conducted using combinations of three different flux algorithms and three different meteorological forcings. A few non-FVCOM model outputs were also included for further evaporation analysis. Model-simulated water temperature and meteorological forcing data were validated with buoy data at three locations in Lake Erie. The simulated sensible and latent heat fluxes were validated with the eddy covariance measurements at two offshore sites. The evaluation showed a significant increase in heat fluxes over three days, with the peak on the 18th of November. Snow water equivalent data from NOAA’s NOHRSC showed a spike in water content on the November 20th. The ensemble runs presented a variation in spatial pattern of evaporation, lake-wide average evaporation, and resulting cooling of the lake, however, the overall analysis showed significant evaporation from Lake Erie appeared to be the main contribution to the LES event. SMITH, J.P.(1), MASON, L.(2), QIAN, S.S.(3) and GRONEWOLD, A.D.(4) – (1)CILER, G110 Dana Building 440 Church Street, Ann Arbor, MI, 48109-1041, USA; (2)University of Michigan, School of Natural Resources, 440 Church St., Ann Arbor, MI, 48109-1041, USA; (3)The University of Toledo, Department of Environmental Sciences, 2801 West Bancroft St., Toledo, OH, 43606-3390, USA; 4NOAA Great Lakes Environmental Research Laboratory, 4840 S. State Rd., Ann Arbor, MI, 48108-9719, USA. Markov Chain Monte Carlo (MCMC) methods have made realistic modeling possible and are widely used in areas such as genetics, ecology, biostatistics, economics. Software packages, such as Just Another Gibbs Sampler (JAGS), have made MCMC accessible to many scientists, engineers, and other professionals looking to utilize the method. This high-level talk discusses the theory, the JAGS package, and a few applications including analyzing the effects of climate change on Great Lakes ice cover and water budget modelling. Effect of light exposure and nutrients on buoyancy of Microcystis colonies. MING, T.(1), VANDERPLOEG, H.A. (2), ROWE, M.D. (3), FANSLOW, D.L. (2), STRICKLER, J.R.(4), MILLER, R.J.(3), JOHENGEN, T.H. (3), DAVIS, T.W. (2) and GOSSIAUX, D.C.(2), – (1)School of Natural Resources & Environment, University of Michigan, 440 Church St., Ann Arbor, MI, 48109, USA; (2)NOAA Great Lakes Environmental Research Laboratory, 4840 S. State Rd., Ann Arbor, MI, 48108, USA; (3)Cooperative Institute for Limnology and Ecosystems Research, 440 Church St., Ann Arbor, MI, 48109, USA; (4)Great Lakes WATER Institute, University of Wisconsin – Milwaukee, 600 E. Greenfield Ave., Milwaukee, WI, 53204, USA. Understanding the vertical distribution of Microcystis spp. is important for improving satellite-derived estimates of bloom biomass and for predicting the transport of blooms. For example, the Lake Erie HAB Tracker forecast model is initialized from satellite imagery, then predicts the transport and vertical distribution of harmful algal blooms (HABs) in Lake Erie over a five-day period. To improve vertical distribution predictions, we used novel videographic methods to determine effects of light intensity, colony size, as well as dissolved and particulate nutrient concentrations on the buoyant velocities of Microcystis colonies collected from western Lake Erie. We incubated whole water samples in two 2L borosilicate bottles in an outdoor incubator maintained at ambient lake temperatures. Light levels were varied to represent day and night conditions for a surface scum or turbulent mixed layer distributions. After an overnight dark adaption, subsamples from each bottle were collected in the morning and evening, then buoyant velocities were measured. In general, colonies were positively buoyant with rates increasing with colony size. However, varying nutrient and light conditions differentially impacted buoyancy rates of Microcystis colonies. Skill Assessment of the Lake Erie HAB Tracker Forecast Model using Variable Spatial Neighborhoods. OUYANG, W.(1), ROWE, M.D. (2) and ZHANG, H.(2), – (1)School of Natural Resources and Environment, University of Michigan, Dana Building 440 Church Street, Ann Arbor, MI, 48108, USA; (2) Cooperative Institute for Limnology and Ecosystems Research, University of Michigan, G110 Dana Building 440 Church Street, Ann Arbor, MI, 48108, USA. Forecasts of harmful algal bloom (HAB) spatial distribution are useful to public water systems, anglers, and recreational boaters. The Lake Erie HAB Tracker model is initialized from satellite-derived HAB spatial distribution, then uses a hydrodynamic forecast to predict the transport and vertical distribution of HABs in Lake Erie over a 5-day period. The model was assessed previously using pixel-by-pixel skill statistics; however, such statistics produce large penalties for small spatial mismatch between simulated and observed fields. Here, we used an alternative approach, fractions skill score (FSS), which has been used in precipitation forecast skill assessment. FSS assesses model skills over a series of increasing spatial neighborhood sizes. Model skill may improve with increasing neighborhood size if spatial mismatch between simulated and observed fields is a problem. We calculated FSS for a series of 26 hindcast simulations from 2011. We compared model skill to a benchmark persistence forecast, which assumed no change from the initial satellite image. Model skill exceeded that of the persistence forecast initially, but the advantage decreased at day 7. Model skill was greatest at 1 km neighborhood size for days 1-2, but improved at neighborhood size of 3-5 km for days 3-6, a period when the forecast is more challenging. Hydrodynamics of Western Lake Erie. Prediction of harmful algal blooms in Lake Erie depends on the accuracy of hydrodynamic models that provide information on lake circulation and temperature. Until recently, long-term observations of circulation in the western basin were practically non-existent, but in summer 2015 GLERL deployed 4 ADCPs that revealed highly variable circulation patterns. To evaluate model skill and better understand the dynamics of Lake Erie’s western basin, we compare FVCOM model results with current and temperature observations conducted in Lake Erie. The Great Lakes Aquatic Nonindigenous Species Information System Watchlist. ALSIP, P.(1), RICE, N.M.(2), IOTT, S.(1), STURTEVANT, R.A.(3), MARTINEZ, F.(4) and RUTHERFORD, E.S. (2), – (1)Cooperative Institute for Limnology and Ecosystems Research, 4840 South State Road, Ann Arbor, MI, 48108, USA; (2)NOAA Great Lakes Environmental Research Laboratory, 4840 South State Road, Ann Arbor, MI, 48108, USA; (3)Great Lakes Sea Grant Network, 4840 South State Road, Ann Arbor, MI, 48108, USA; (4)NOAA NCCOS, 4840 South State Road, Ann Arbor, MI, 48108, USA. 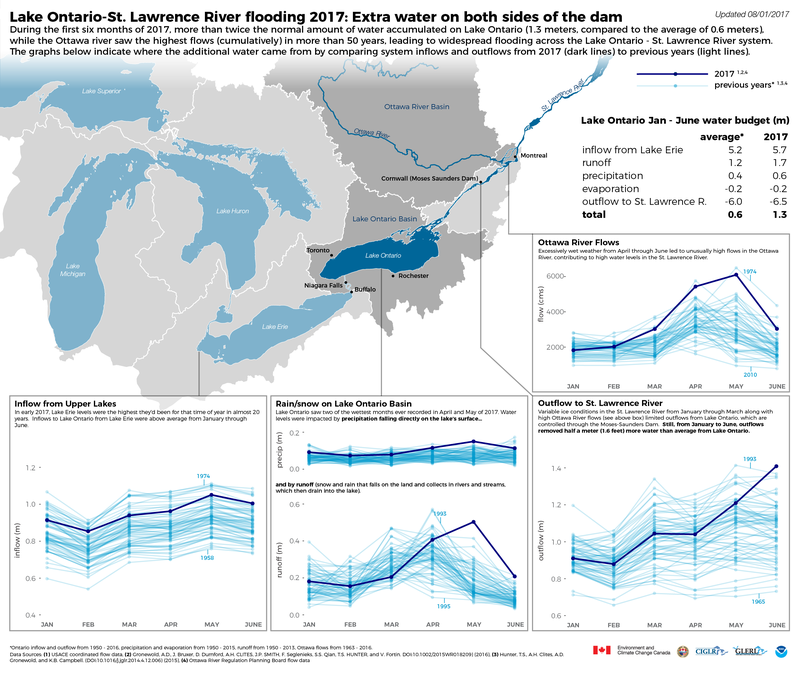 The Laurentian Great Lakes is one of the most heavily invaded aquatic systems in the world with over 180 documented aquatic nonindigenous species, the peak invasion rate was estimated to be 2.8 species introduced per year (1990-1995). While invasion rates have slowed in recent years, prevention remains the best defense. The Great Lakes Aquatic Nonindigenous Species Information System (GLANSIS) currently serves information for 67 species which have been identified through the peer-reviewed scientific literature as having some likelihood of invading the Great Lakes. This poster was developed primarily as an outreach tool to help scientists and citizens know what to look for in monitoring for the presence of these species. Monitoring is essential both to determine the success of prevention programs and to support early detection – early enough to make true rapid response and eradication feasible. The poster links back to the GLANSIS database, which includes further information about the potential for introduction, establishment, and impact of these species as well as more detailed information on how to identify the species and information on management options in the event they are detected. Categories: Communication, Event, Research | Permalink.